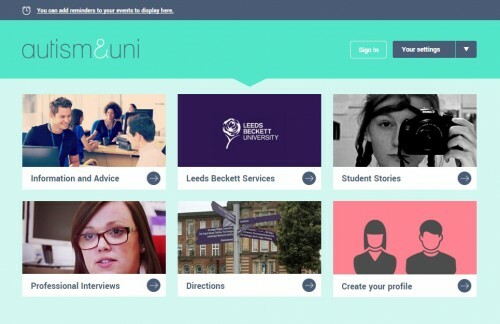 The Autism&Uni Online Toolkit gives students information and strategies for overcoming the challenges they typically encounter during the transition to university. The underlying ethos of the toolkit is that students can use it in their own time, do research about issues concerning them, and come back to it when particular difficulties arise. The toolkit is freely available for universities to adopt and adapt. We invite universities in Europe to use the free toolkit. Built on an open-source platform, the toolkit is currently available in English, Finnish, Dutch, Polish and Spanish. We can help with the initial set up and give advice on how best to support your students on the autism spectrum. Each toolkit comes pre-installed with some content. However, adaptation and further extension is recommended as much of the information autistic students want is specific to each institution, e.g. the support services available at that institution and details of the buildings, people and infrastructure. 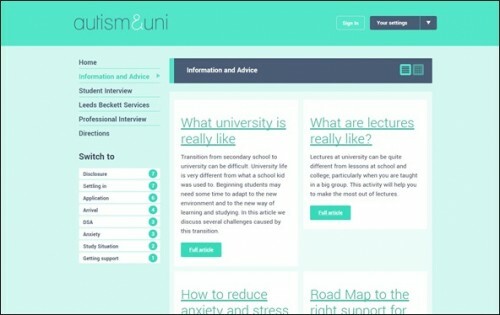 Telling the university about your autism Many autistic students do not declare their autism before starting university, which may prevent access to support at the start of the study when it matters most. The toolkit also covers the UK disability assessment procedure. Managing expectations Many autistic students (and their parents) have expectations that do not match the real situation at university. Our surveys provided many accounts and quotes to support this. The toolkit covers some of the unwritten rules of university life and what may be different when compared to secondary education. Help with getting to campus locations Students reported getting repeatedly lost on campus and not remembering items on their timetable. And when they are late there is a reluctance to enter a class. The toolkit has a section where universities can show key campus locations and directions between them. Students can then link this with their smartphone calendar to find out where to be when. Typical study situations It can be difficult for autistic students to get used to the conventions that exist in lectures, seminars, during group work and when studying independently. The toolkit gives advice on what to do in certain unfamiliar situations, e.g. when working with other students in a group. Managing difficult situations It is important for students to advocate for themselves. Parents and teachers were very vocal about this, and a number of typical situations were identified (e.g. talking about one's autism, complaining about something, when and how to arrange a meeting with a tutor). The toolkit covers this in brief, to the point activities. Under each theme, the student can explore background information, find out why the information may be relevant to them (or not), act on a call to action and consider some practical tips and activities that may help in overcoming the challenge faced. The toolkit was developed using a participatory design approach, involving autistic students in the design of both content and visual appearance. In response to feedback from these students, the content is text-centred, adopting a factual and non-judgemental tone and is presented in a logical and easy-to-navigate interface. For details of the methodology employed and the evidence base we used to make decisions about the toolkit content and structure, please read the project publications.